Torontonians sometimes forget about the restaurants that populates their hotels, with the exception of those manned by celebrity chef imports. Perhaps it’s the sentiment that the restaurants are for tourists and travelers, those where expense isn’t an issue, surely not for you and I that inhabit the city daily? It’s nice to be reminded that there are benefits to visiting these establishments: there’s generally tables available for walk-ins (after all, it’d be in poor taste to have to turn down hotel guests), the menus tend to be varied (allowing groups to accommodate tastes and dietary restrictions), and their dining rooms are oh so comfortable. 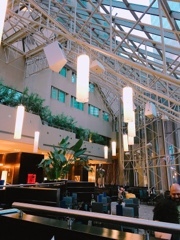 At Azure, the flagship restaurant in the Intercontinental Toronto Centre, their window canopy opens up the space and offers a great people-watching vantage point. The dark wood and plush velvet furnishings helps keep the dining room cozy and comfortable – you can sit at the table for hours. Unlike the current trend of cramming small tables (sometimes communal *shudder*) together making for a horribly loud atmosphere, Azure gives you space to converse and a sense of privacy that I often crave. Ah… tranquility. Their service is impeccably polished and efficient, common traits of the hotel industry, yet still down-to-earth and approachable. Even before asking what we wanted to drink, our server Coco chatted care freely with us, giving us time to settle down and build a rapport. In quick succession, a basket of warm rolls were presented and a generous glass of red wine to fully take the winter chills out of my bones. In no time, the first Winterlicious ($48) course was served. Similar to a ceviche, the escabeche marinates the octopus and scallop in an acidic solution. However, in this case, the seafood is poached first before the marinade so the texture remains tender and the tartness is mellow and manageable. I did find it a tad under seasoned (a sprinkle of salt from the table helped rectify this), given the citrus vinaigrette is light. 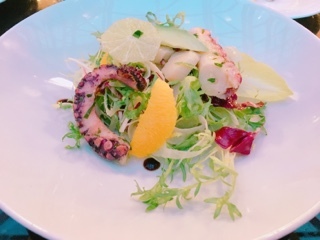 Amongst the meaty octopus and delicate scallop were crunchy shaved fennel and endives, juicy orange and lime segments, and creamy avocado. A delicate and surprisingly bright start – a glimpse into the warmer spring months ahead of us. 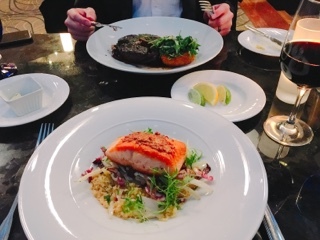 Despite being cooked through (my first instinct is to look for the slightly translucent rose centre), the grainy mustard coated salmon was still moist. The sear from a high heat helped develop a lovely golden crunchy crust and locked in its fatty juices. 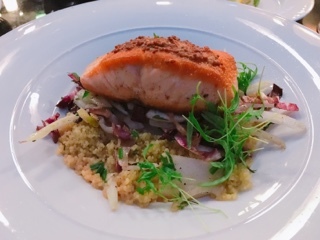 It sat on top of a bed of crunchy shaved fennel and radicchio that just ever so slightly wilts from the salmon’s heat. All the juices and flavours meld into the fluffy savoury citrusy couscous on the bottom. Azure certainly doesn’t skimp on portions. 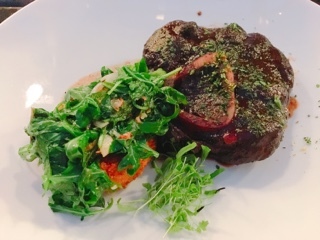 A huge port and black cherry osso bucco arrives with an equally sizeable marscarpone crispy risotto cake. The veal shank was braised just long enough to make the meat tender, but not overly done so that the bone marrow disintegrated (save a piece of bread to scoop the gelee marrow onto). Although I found the centre of the risotto cake too mushy, it was my husband’s favourite part of the dish. Mine, aside from the osso bucco, was the wilted arugula that had a lemony gremolata mixed into it. After a heavy meal, it was exactly the last savoury bite I needed. 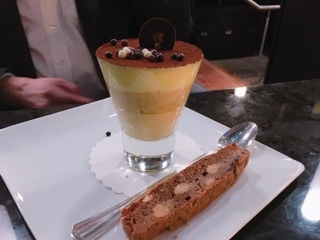 If only the tiramisu parfait had more espresso (or in this case the boozy Kahlúa liqueur) and less of the powdery cocoa on top the dessert would have been lovely. The mascarpone mousse was creamy and luxurious, the savoiardi cookies adding a bit of cake to the tiramisu. A perfect sphere of ice cold honeycomb ice cream sat atop the slightly warm apple tart. 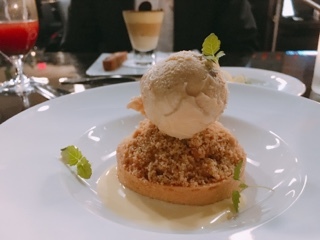 The pastry was good – the shortbread crust not overly buttery, large chunks of apples and a sweet enough crumble. I felt bad leaving some unfinished, but what a huge portion after the substantial mains. Even if the comfortable atmosphere doesn’t convince you that hotel dining isn’t just for tourists, the generously proportioned dishes could – mains are pricier but you won’t leave hungry. Of course, you can always visit them during special occasions when they have prix fixe deals: aside from Winter/Summerlicious there’s also drink and menu specials on key dates (this Valentine’s Azure is offering a $70 menu with $14 cocktails). Torontonians, next time you’re looking for a comfortable dining experience, consider a hotel. After all, why would you only treat yourself while travelling?